UC Berkeley senior Marika Goodrich (left) and alumnus Zachary Miller were charged with misdemeanors Monday after being arrested last Friday. Goodrich was released without posting bail; Miller was denied release. OAKLAND-Two protesters arrested during Friday's Southside riots were charged with misdemeanors and pleaded not guilty to all counts in the Alameda County Superior Court Monday. UC Berkeley senior Marika Goodrich, 28, pleaded not guilty to charges of assault on a peace officer and resisting arrest, according to her attorney, John M. Hamasaki. Zachary Miller, 26, pleaded not guilty to resisting arrest and two counts of attempting to remove a peace officer's non-firearm weapon, according to his attorney, Graham E. Archer. The presiding judge, Karen A. Rodrigue, granted a request by Goodrich's defense to have her released Monday without posting bail. Hamasaki argued for Goodrich's release at the hearing by noting that she is a graduating UC Berkeley senior who works for the campus, is missing both school and work due to the arrest and has no history of violence. Rodrigue said she would have restricted Goodrich from returning to campus if she were not both a student and employee. Miller, a UC Berkeley alumnus and organizer for the "Rolling University" activist group, was denied release due to three outstanding probation violations and had bail set at $14,000. In arguing for his release, Archer said at the hearing that the probation violations were a "previous chapter" of Miller's life and that he is a UC Berkeley alumnus who "has ties to the community," owns a bike shop and is involved with student movements. 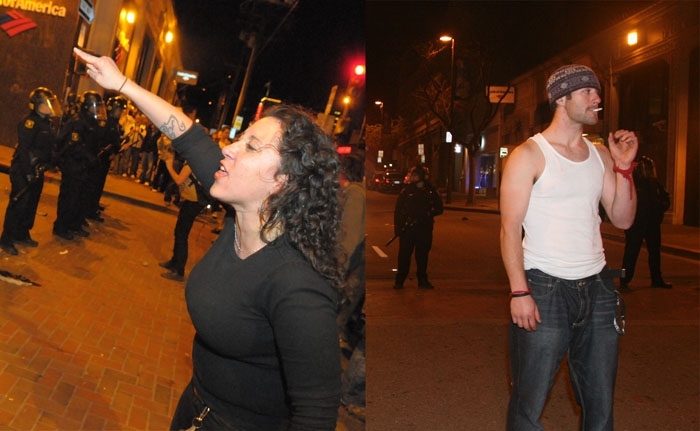 Both defendants were arrested early Friday morning during a riot south of the UC Berkeley campus. Goodrich was originally booked for assault on a police officer, inciting a riot and resisting arrest. Miller was booked for inciting a riot, resisting arrest and obstructing a police officer. The defendants' pre-trial hearing will be held Tuesday at 9 a.m. at the Wiley W. Manuel Courthouse in Oakland. Because Goodrich was granted a release, her obligation to appear pre-trial was waived. Full trial proceedings are scheduled to begin March 19. Callie Maidhof, an activist and first-year doctoral student in anthropology who was present at the arraignment, said she believes that Miller and Goodrich's arrests were "part of a systematic targeting of student activists," which she said includes student conduct charges in addition to the formal legal charges that they were given.